Posted in Puja Fund News, Retreats and Practices. 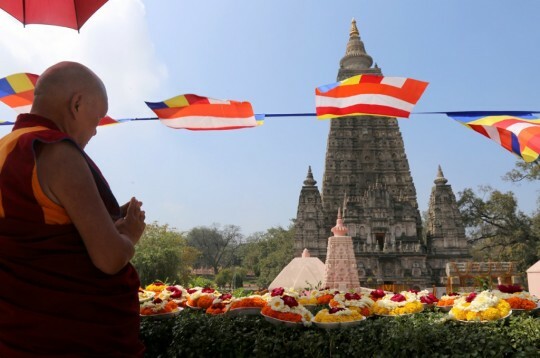 Lama Zopa Rinpoche making offerings to the Mahabodhi Stupa, Bodhgaya, India. Photo by Ven. Thubten Kunsang. Lhabab Duchen, one of the four great holy days of the Buddhist calendar when merit is multiplied by 100 million times, takes place this year on Wednesday, October 31. 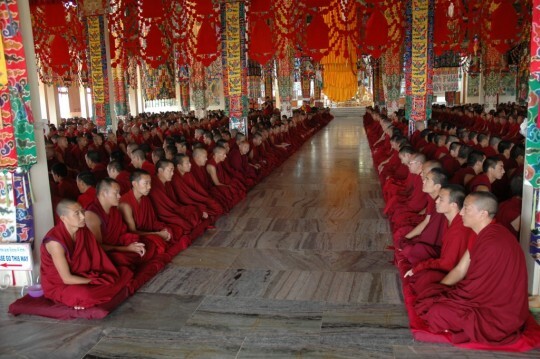 On this day, up to 15,650 Sangha are sponsored through the FPMT Puja Fund to offer specific pujas and engage in particular practices selected by Lama Zopa Rinpoche and dedicated to the long life of His Holiness the Dalai Lama, and to the success of all the FPMT centers, projects, services, students, benefactors and those serving the organization in any way, as well as all beings. The monks of Sera Je Monastery offering puja. Take a few moments on Lhabab Duchen to join in with prayer in your mind and rejoice that thousands of ordained Sangha are engaged at all of the above at the exact same time and this merit is multiplied 100 million times. Specific advice from Lama Zopa Rinpoche for practices to do on merit multiplying days can be found on FPMT.org, including advice to recite the Sutra for Remembering the Three Jewels. (Advice for merit multiplying days can also be found in French.) If you choose to recite the Sutra of Golden Light on this special day, you might like to report your recitations using the facility on the FPMT website, which you can find on the Sutra of Golden Light reporting page. All are welcome to donate to the Puja Fund and directly support the merit accumulated by hundreds of millions of prayers and pujas on this holy day by thousands of ordained Sangha.